Productive Measures Strescon overhauls flagship architectural line BY DON MARSH Strescon's investment in the architectural batch plant coincides with strength in the At- lantic Canada market, which has weathered the recession better than most of the U.S. As the Saint John, N.B., plant project neared, the producer pondered handling construction in house, then deferred to MCT, which per- formed all steel erection, plus mechanical and electrical assembly. Strescon placed the foun- dation and provided cranes and man lifts. In addition to the Saint John site, Strescon has a precast/prestressed operation in Bed- ford, Nova Scotia, just outside Halifax. Among recently added sister businesses under OSCO Construction Group is Borcherdt Concrete Products in Yarmouth, Nova Scotia. Strescon serves Eastern Canada, Northeast states and Bermuda. Acquisitions and plant investment in the past decade have allowed OSCO Construction Group of Saint John, New Brunswick, to consolidate its role as a heavy civil contractor and leading ready mixed and manufactured-concrete producer in the Canadian Maritimes. 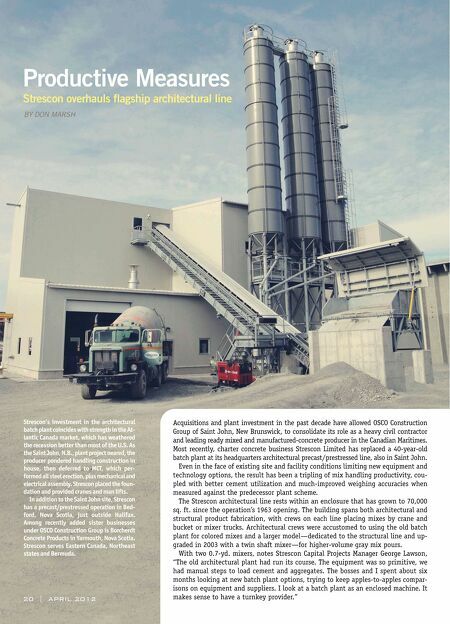 Most recently, charter concrete business Strescon Limited has replaced a 40-year-old batch plant at its headquarters architectural precast/prestressed line, also in Saint John. 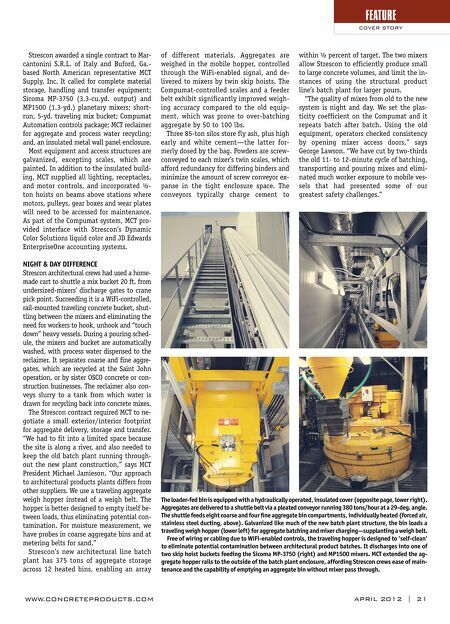 Even in the face of existing site and facility conditions limiting new equipment and technology options, the result has been a tripling of mix handling productivity, cou- pled with better cement utilization and much-improved weighing accuracies when measured against the predecessor plant scheme. The Strescon architectural line rests within an enclosure that has grown to 70,000 sq. ft. since the operation's 1963 opening. The building spans both architectural and structural product fabrication, with crews on each line placing mixes by crane and bucket or mixer trucks. Architectural crews were accustomed to using the old batch plant for colored mixes and a larger model—dedicated to the structural line and up- graded in 2003 with a twin shaft mixer—for higher-volume gray mix pours. With two 0.7-yd. mixers, notes Strescon Capital Projects Manager George Lawson, 20 | APRIL 2012 "The old architectural plant had run its course. The equipment was so primitive, we had manual steps to load cement and aggregates. The bosses and I spent about six months looking at new batch plant options, trying to keep apples-to-apples compar- isons on equipment and suppliers. I look at a batch plant as an enclosed machine. It makes sense to have a turnkey provider."